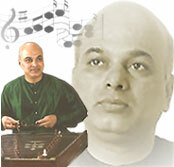 Pandit Vyas commanded an ever widening following. His disciples include several well-known and younger artistes. His several albums in the form of LP Records, Cassettes and CDs have been released by HMV, Polygram (Universal), Venus, Navras Records, Music Today, Sony Music, T-Series etc.